Data on County Incomes and Regional GDP for 2014 was released by the CSO this week. While preliminary figures for 2014 were released last year this release provides the official data for 2014. Unlike last year, however, the preliminary figures for the following year (which would have been 2015 in this case) have not been released. In this post County Incomes in the Western Region are discussed and Regional GDP will be considered next week. The map (produced by the CSO) gives an overview of the levels of Disposable Income across the State. Disposable Income per person is the focus of this post, this is made up of Primary Income plus Social Transfers less Taxes and Charges. The changes in the components of Household Income will all affect income level but these will be considered in more detail in a future post. Table 1 shows Disposable Income per person for the seven counties Western Region counties and for the State. 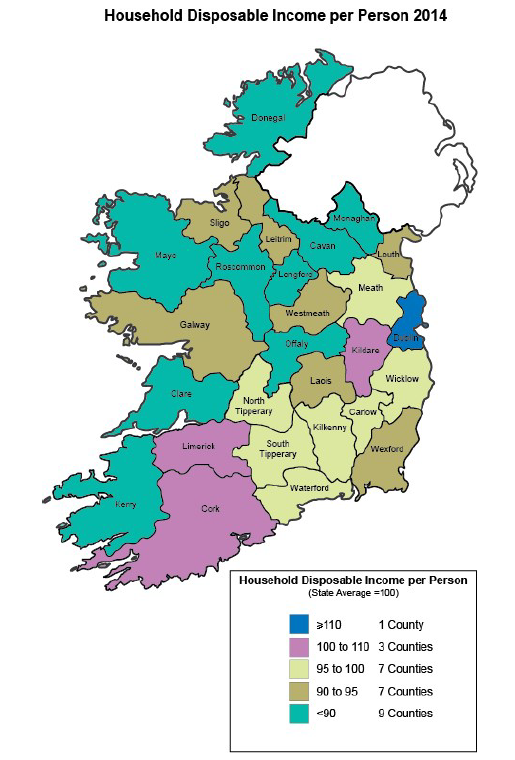 While Disposable Income per person in 2014 was €19,178 in the State, it was €16,963 in the Western Region. For both there was an increase on 2013, by 3.5% for the State Disposable Income per person and by 1.9% for the Western Region. The highest Disposable Income per person in the Western Region was in Galway (€17,929), while the highest nationally was in Dublin (€21,963 per person), some €4, 034 higher than Galway. Donegal (€15,061) had the lowest Disposable Income in both the Western Region and nationally. In the Western Region the gap between the county with the highest Disposable Income per person (Galway) and the lowest (Donegal) was €2,751 in 2014. This gap between the highest and lowest has narrowed slightly since 2013 when the gap between the Donegal and Sligo was €2,802. 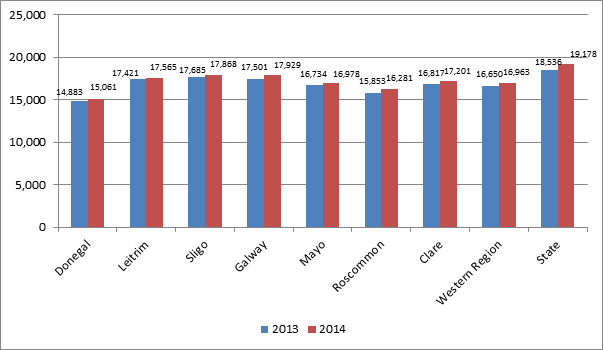 Revision of the 2013 figures (which reduced the Disposable Income per person figure for all of the Western Region counties) meant that Sligo had a higher Disposable Income figure than Galway, for the first time in 2013. 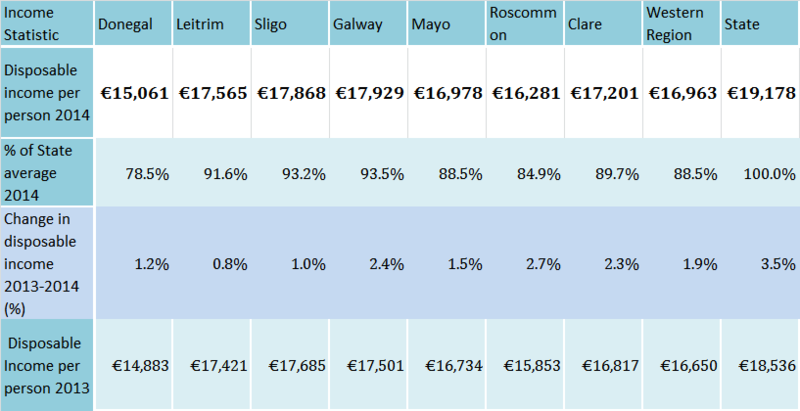 By 2014 Galway was again ahead but only by €61 per person. Looking over the longer term (since 2006) incomes in 2014 have still not regained the levels seen in 2006 (see Figure 2), and are still some distance from peak levels in 2008. Some of this may be explained by higher taxes and charges and lower social transfers than in 2008 and this will be examined in more detail in a forthcoming post. While Figure 2 shows the actual Disposable Incomes per person, when considering the trends among counties it is useful to use Indices so that county figures can be examined relative to the State (State=100). This is shown in Figure 3. 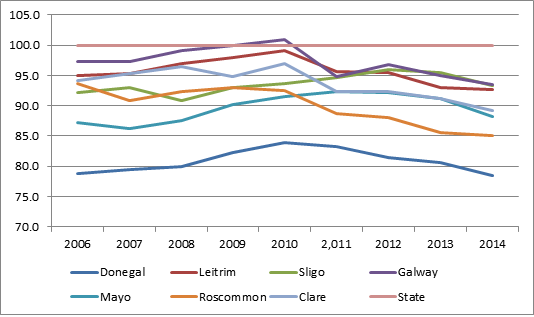 Disposable Income in Galway has been consistently the highest in the region (except for 2013) approaching the State average from 2006 onwards and in 2010 surpassing it with an index value of 100.9. Since then, however, it has been relatively lower and in 2014 it was only 93.4% of the State figure. In 2014 Sligo was also at 93.4% of the State Disposable Income per person, and over the longer term the income in Sligo has been improving relative to the State, rising fairly consistently from 92.2% in 2006. 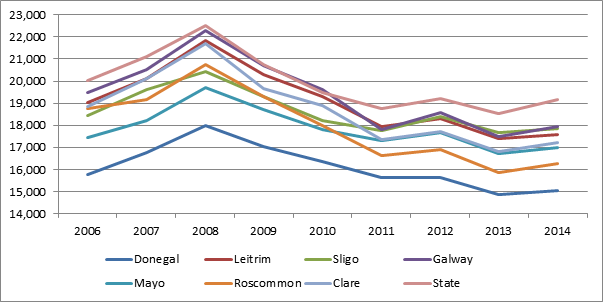 In contrast both Clare and Roscommon have shown significant relative declines since 2006 when Clare was 94.2% of the State average and Roscommon was 93.6. In 2014 Clare was 89.2% of the State average and Roscommon was only 85%. Donegal has consistently had the lowest Disposable Income per person in the country at only 78.8% of the State in 2006 and 78.04% in 2014. In 2010 it peaked at 84% but this was largely due to the lower State figure in that period. This post has provided a brief overview of the key County Income figures released this week for the Western Region. The components and trends will be analysed in more detail in the coming months. It should also be noted that the 2013 figures have also been revised. This entry was posted in Economy, Regional Development, Regional Statistics, Rural Development. Bookmark the permalink.